Samsung Series 8 LCD HDTVs Announced | OhGizmo! With the digital transition coming in 2009 the LCD HDTV market is booming as people upgrade to new TVs. When it comes time to buy a new HDTV you have to decide between LCD or plasma technology for the most part. 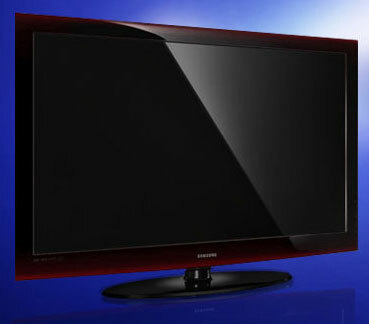 Samsung has introduced several new HDTV models recently including some new plasma sets. Samsung didn’t leave the LCD HDTV fan out either and introduced a new Series 8 line that includes models 850 and 860 both in 46-inch or 52-inch screen sizes. The new TVs feature the Samsung Touch of Color design that puts color inside the plastic housing of the TV rather than simply painting it on. Both the 850 and 860 models share similar specs with 50,000:1 contrast ratio, 120Hz refresh rate and four HDMI inputs as well as other input types. The TVs are also very thin at only 1.9-inches at the thickest part. The response time for the models is 4ms, which should mean no issues with ghosting or smearing during fast action. Speakers built into the TVs are downward firing and include a sub woofer and SRS TruSurround XT technology. The only apparent difference in the 850 and 860 models is that the 860 has a second WiseLink Pro USB 2.0 port. The 850 in 46-inch will retail for $2,699.99 and the 52-inch will sell for $3,399.99. The 860 46-inch will sell for $2,799.99 and the 52-inch will retail for $3,499.99.